Blogs, social network sites like Facebook, and “microblogging” platforms like Twitter are technologies that facilitate communication, sharing and collaboration. They make information travel further and faster. These are the tools that empower individuals and explain the growing number of overnight phenomena in the world. It’s hard to imagine the Arab Spring taking hold without Twitter; Kony rise to notoriety without YouTube, or breast cancer awareness skyrocketing among youth without the “I like it on…” Facebook handbag campaign. Here’s a big reason why these tools are so effective: they give individuals the power to share information with friends and other like-minded individuals. Consider this simple question: how would you prefer to absorb information - from an ad - or via dialoguing through a community centered around a brand you are interested in? Companies recognize how powerful these tools are- and the benefits that can accrue from them. If a company can harness the “social networks” then they have an army of customers who act as their marketing departments! Like many women, I love cosmetics and keep up-to-date with the online world of beauty-via the beauty community on YouTube. It's through this community that I interact with, and share my passion for brands and their products with other cosmetic lovers around the world. While catching up on beauty blogs one day, an interesting discussion arose in the community forum: Which cosmetic brands have the biggest online followings? I decided to investigate this question beyond which the members that the community forum had. This question is particularly interesting because it also leads to other insightful questions: Do higher end brands have more followers because of their aspirational nature? Do more youthful brands have more followers because the online world skews to younger audiences? Would the best selling cosmetics brands in the world (L’Oreal/Estee Lauder) have their sales leadership extend into the online community world? To gain some perspective, I tracked mainstream cosmetics brands (L’Oreal, Maybelline, Revlon, Covergirl, Rimmel) and higher end brands (Estee Lauder, Lancome). I tallied their online following by checking a variety of metrics: YouTube subscribers, YouTube views, Facebook likes, and Twitter followers. Today, I’ll share my findings- some of which are surprising! 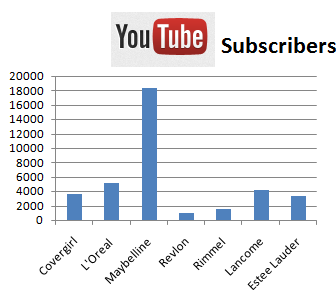 The first observation that I will make is that Maybelline is the clear YouTube subscriber winner. There could be a lot of factors explaining this. Perhaps, Maybelline was the first to be listed on YouTube. This is not the case. It turns out that most of the brands (including Maybelline) developed their YouTube channels around 2006. Maybe, Maybelline posts more content? Not true. Several brands (including the parent L’Oreal) have posted more videos. In fact, a lot of the YouTube content posted by each brand is similar. For instance, you can find a lot of expert advice on the application/ uses of cosmetics from each brand. Perhaps, Maybelline’s YouTube success is due to its younger audience (in keeping with people who surf the web more)? Once again, this is not the reality. Rimmel, like Maybelline, also targets the younger audience (RMG Agency). So what is the explanation for Maybelline's subscriber supremacy? I believe that the answer lies in what differentiates Maybelline as a brand. There are two reasons. First, Maybelline is uniquely positioned as the young, trendy, fashionista brand with an edge. It’s the brand for the girl that goes out on the town. She knows the hottest spots and gets VIP entrance because she’s connected. She’s socially connected in the real world and online. She's ultra-linked with YouTube, Facebook, and Twitter. This "social connection" is endowed on the brand and is the magic behind the Maybelline YouTube subscriber leadership. 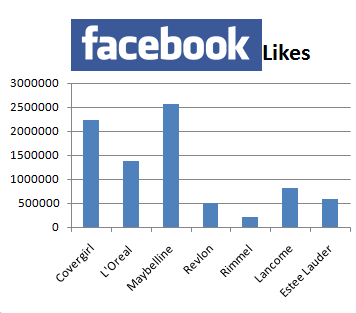 Similar stories hold true for Maybelline in the other key metrics. The brand holds the leadership position for number of YouTube views (1,779,544), Facebook “Likes”(2,552,102), and “most talked about” (58,882). In fact it takes the lead in all metrics that I looked at except for one-Twitter followers where it is ranked #2 with 40,415 followers to date. In my opinion, what is most impressive is that Maybelline outshines higher end brands in these categories. The brand gives evidence that its not always the highest end brands that have the strongest online community followings. I’d like to conclude my post with one thought. As the world moves more and more into social media (and the online world), there are going to be more of these socially connected girls. The future looks bright for Maybelline.